The last 7 days has seen the government’s welfare reforms hit crisis point with the ATOS Healthcare withdrawal from the WCA assessments and the immediate suspension of repeat assessments, leaving 1000s of fit people on benefit they do not need. Many groups are rejoicing at the announcement, wanting to take credit for this happening including the ‘work shy’, the sickmovement, the anti-cuts activists, Labour politicians and the anti-government media. But the people who will not be rejoicing or claiming credit for this mess is those who matter but have been forgotten in all this, real disabled people. Before explaining why real disabled people are not rejoicing, I think its important to understand from my perspective how and why ATOS walked away from its contract, as opposed to being axed as many want to believe. The answer is simply firstly the consistent and persistent accusations that ATOS has murdered countless claimants, with figures of 43 murders a week claimed by some, without any proper evidence or the involvement of the police. 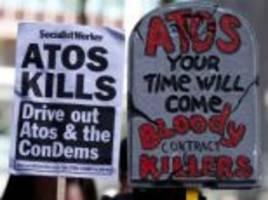 The irony is those who claim ATOS have murder claimants are probably more likely to have incited people towards suicides with their paranoia and lies. The second reason as just been released from ATOS, which is the fact their staff have received 160 incidents of abuse per month including death threats. This does not surprise me at all as I have personally experienced a barrage of cyber-abuse on a daily basis since I publicly reported I intended to work with ATOS to improve their services last summer. Now in some quarters I am regarded as the most evil disabled person in the country who deserves whatever I get simply because ‘I worked for ATOS’, discrediting anything else I have said or done. What I feel should be understood if that all the people who want to take credit for what was happened, then they are admitting they have something to do with the death threats, even it is just inciting others with lies, as well as the many suicides they have used to unfairly attack ATOS with. I feel their claims and actions must clearly be regarded as domestic terrorism, in the same way as if these actions were taken against a privately run prison. I however sadly feel this government does not have the backbone to make the necessary arrests and so giving the message the ‘work shy’ are unstoppable and above the law. Now billions of pounds will have to be wasted on finding a new way of getting the apparent ‘work shy’ back to work in a manner the Guardian readers, those who cry if they see someone with a broken nail, will find acceptable. And here is why real disabled people, those with high support needs or do not see their health as a meal ticket, are not rejoicing, because it will mean lots of cuts to people with high support needs who no longer have a voice in disability politics. Since the sick and ‘work shy’ who have protested against ATOS have a low opinion of themselves, they have an even lower opinion of those they regard as ‘profoundly disabled’, and so do not care if our services are cut to pay for their endless demands since deep down they think we are better off dead. The lesson to be learnt in all this is the deep rooted prejudices against disabled people are alive and kicking, and that the demise of ATOS is a symbol that the public, including many people who regard themselves as disabled, are not ready to see disabled people as equal citizens, who have a contribution to make to society, and will use terrorism to defend the right to see disabled people as unemployable burdens of welfare, who should be cared for by the state using the same values demanded by the Animal Rights Movement. The protests against ATOS have been in the name of pity, and a ‘kindness’ for disabled people as inferior beings that is in fact hateful. I have no idea where we go from here but I know I am ashamed of a country where government policy is now dictated by murders and death threats. The equality, inclusion and liberation real disabled people has foughtfor over the last 50 years is quickly being undone by those who claim to be disabled so they can not work, especially as the voice of real disabled people is lost in the midst of these acts of domestic terrorism.